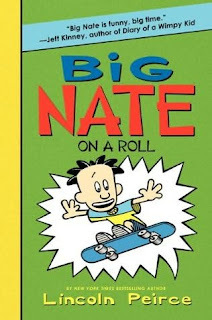 This is the first time we read a Big Nate novel and it won't be the last, simply because both my kids liked it a lot. My son, especially. And this is important to me since he loves books but is not a big reader. Two thirds into the book, he said something interesting to me. He noted that the book focused on one thing—Nate trying to win the grand prize (a customized skateboard) for his scout troop fundraiser. I knew what he was trying to say. The plot was straightforward and not too complicated. However, even if the plot was simple it was certainly well-developed with all the same elements of any great plot. We were kept wondering how Nate was going to deal with all his setbacks. 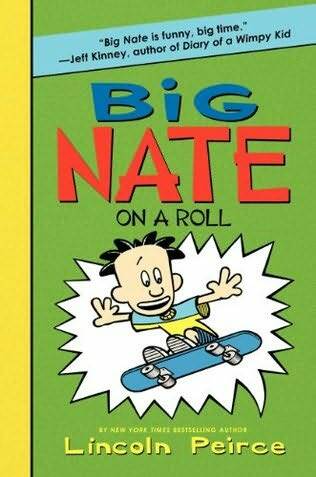 Big Nate is easy to read, funny, and filled with illustrations and comics. Even though Nate was a 6th grader, my 2nd grade son could relate to his dilemmas and he understood the slap-stick humour so loved by boys. My 10 year-old daughter read it in one day and liked it too. Perhaps because Nate goes through moments when he feels like a loser who can't keep up with his classmate Artur—aka Mr. Perfect. Nate comes up with great ideas and works hard to achieve his goal. These were good themes that were handled in a light and humorous way. This book is excellent for reluctant readers. 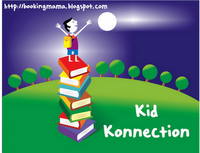 I will look for more books in the Big Nate series to read with my son. Just having him giggle next to me as we read it together was priceless. Disclosure: Thanks to Shannon Parson from HarperCollins for sending me this book for review. I was not compensated in any other way, nor told how to rate or review this product. I love Big Nate. I think I have this one around here somewhere. Will have to check it out. Glad to see you enjoyed this book! The Girl loved the first one and can't wait to read this one. I adore Big Nate! You definitely need to look for more of the books - they're a real treat.